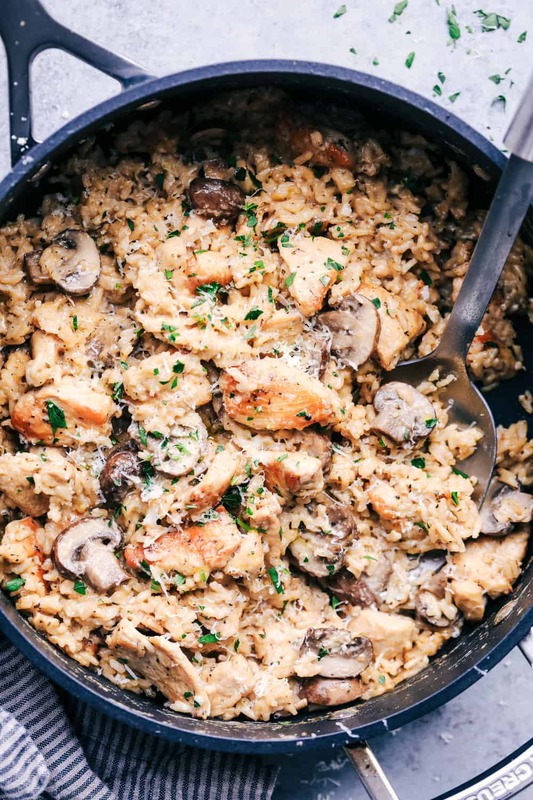 One Pot Creamy Parmesan Chicken with Mushroom Rice will be one of the best things you will ever eat! All you need is one pot to create an amazingly creamy and delicious meal that is ready in under 30 minutes! HOLY YUM!! Brace yourselves for all future recipes having creamy parmesan rice. 😉 This meal has our family obsessed. Like I am talking every single person in the family licked their plate clean. The baby, the toddler, the picky eater, everyone couldn’t get enough of this dish. Dare I say this is the best one pot meal that we have ever had?? 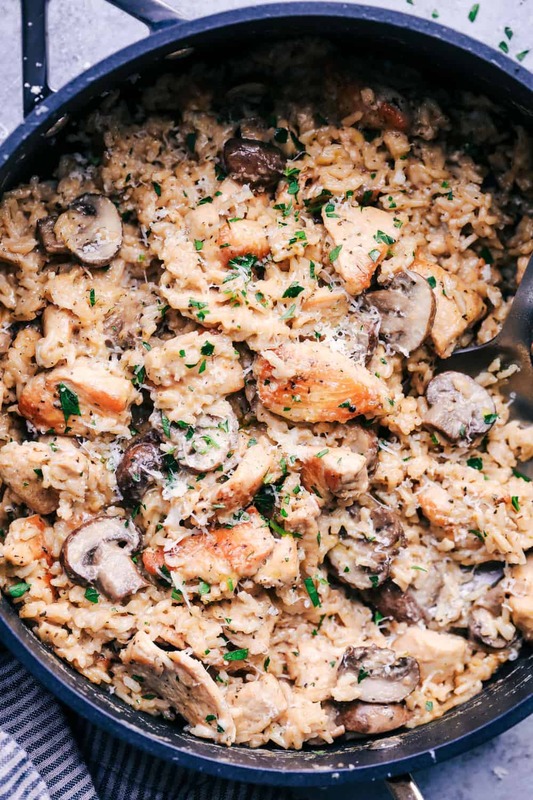 We also love this One Pot Chicken Florentine, but I think that the creamy parmesan rice is what made us fall in love. This dish couldn’t be easier to make. 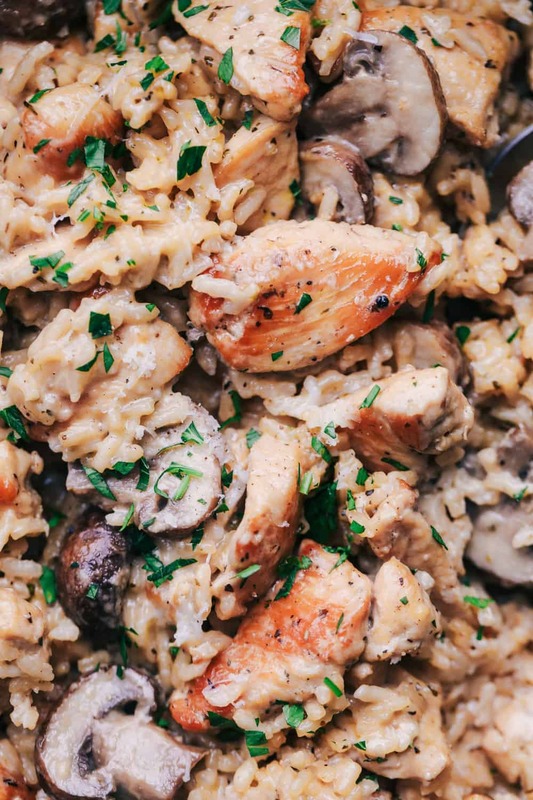 You brown the chicken, dump the rice, stir in some parmesan cheese and heavy cream, and voila! Dinner on the table in less than 30 minutes. You start by adding oil to a medium skillet or pot add in seasonings and brown your chicken pieces. As soon as they are brown, you add the rice, mushrooms, and chicken broth. Let it simmer for about 15 minutes or until liquid has absorbed and then stir in your heavy cream and parmesan cheese. What can I serve as a side dish? 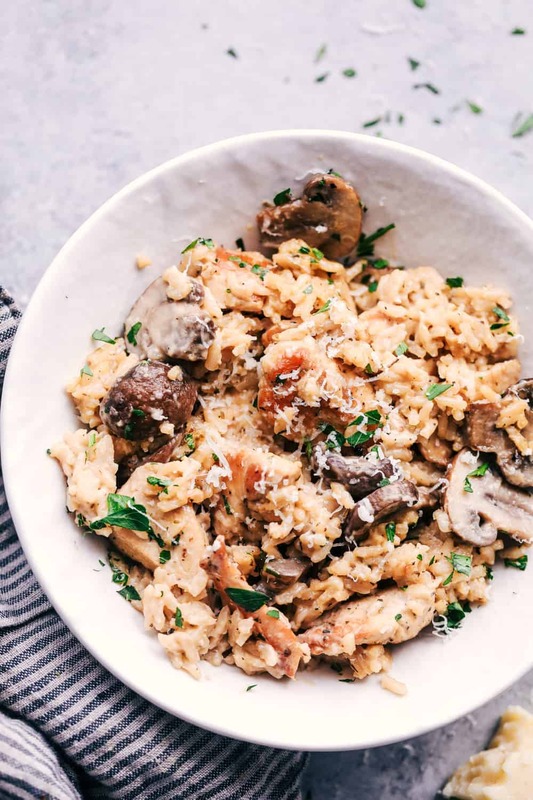 Since this dish already includes rice and mushrooms, a simple side salad and bread make the perfect addition. You guys have got to put this one on the menu this week! I promise the entire family is going to go crazy for it. And the best part is that it is all made in one dish so little clean up is required on your end. It is a win-win situation for everyone and I know you will love it as much as we did! In a medium-sized pot or skillet add the olive oil and turn to medium-high heat. Add the chicken to the skillet along with Italian Seasoning and salt and pepper and cook until the chicken is no longer pink and cooked throughout. Add the uncooked rice to the skillet, chicken broth, and mushrooms. Reduce heat to medium-low and cover and let simmer for 15-20 minutes until rice is cooked and tender. Stir in heavy cream and parmesan cheese and salt and pepper to taste. Garnish with freshly grated parmesan and fresh chopped parsley. I don’t see mushrooms in the ingredient list or in the directions. Add the uncooked rice to the skillet, chicken broth, and mushrooms. Will any long grain rice work? I have Jasmine long grain on hand is why I ask. Wonderful thank you! I’m about to start making this now and really looking forward to it! Sounds yummy! I would like to make this for my dad, does it reheat well? Hi! Do I need to change anything, including liquids or cook time, if I’m using long grain brown rice? Thanks! This looks amazing! Can you substitute palin yogurt for the he4avy cream? Brown rice is not a good idea, it takes to long. Had the creamy Tuscan chicken last week easy and delicious trying the creamy parmesan chicken today looks great best subscription ever maybe not for waist line though lol keep it coming and thanks for introducing me to Italian cooking it’s my fav food. This looks amazing! Can you substitute quinoa or something else lower carb for the rice? and if so, would that affect cooking time? if substituting the rice for cauliflower rice (already riced), how would that effect the amount of broth used and time simmering? Thanks! I had this for dinner tonight with pull apart garlic bread. It was delicious! Thank you for the recipe. Can I substitute cream cheese for the heavy whipping cream? I want to save a trip to the grocery store. thanks for the recipe.. reading the ingredients I found it to be a bit bland, so I sauteed fresh portabellas & diced onions. Then added Purdue all natural chicken strips, parm and Romano… and some spices..it’s a nice quick meal..I was done in about 1 hour. This was just DELICIOUS! and very flexible and forgiving. I had to adapt it because I was using leftover chicken and brown rice,. Also, I prefer shiitake mushrooms which have to be cooked differently than noted. But it’s EASY (without resorting a ‘cream of’ canned soup). It’s a big hit and new favorite. Can you use this recipe to make arancini balls? Any idea on calorie count per serving? The recipe was delicious. We added asparagus to the mix. Yum Yum. Will the rice cook through? I substituted brown rice for white, I started the rice in a separate pot since it takes twice as long to cook. I continued cooking as directed then when the chicken was done I put it and the mushrooms in the pre started rice and continued as directed. I thought it turned out great, Thanks!